Horror is one of my favorite genres! I am constantly scouring for the newest horror out there, the ones that have the reviews that that scream THIS SCARED ME! In the YA world, it is not an easy thing to find, unfortunately. 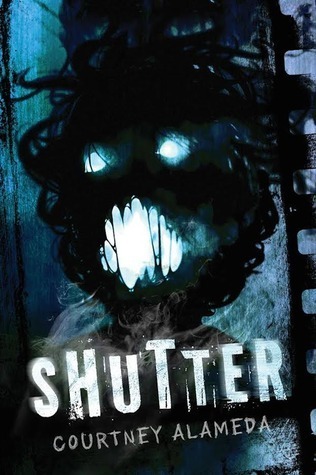 When I saw the cover for Shutter, I got insanely excited. Then the synopsis and I was all in. Thank you Netgalley for allowing me to read this awesome story! I don't want to give too much away, because this book unfolds perfectly, with perfect timing, and each little reveal, each new horror, builds and builds to a fantastic ending! So I will give you the rundown of my likes/loves and then tell you repeatedly... READ THIS BOOK! Micheline is a tetrochromat, one of few, who has trained her whole life to kill monsters,rid the world of ghosts and other horrors. Her father is the man in charge, and they are the last remaining descendants of the Van Helsings. That lineage rules M's dads world, and he expects the same from her, even though their relationship is not what it once was. Micheline constantly feels the need to prove herself, her dad being the hero that he is, and one night with her crew, takes on an incredibly risky, against the rules, job. This night changes everything for the gang, and they have seven days to rectify her mistakes, or they all die. Micheline was a badarse, y'all! I absolutely loved her every second of this story. She has been through hell and back, and she is still tough and strong, and stands on her own two feet. She also has a vulnerable side, and it was nice to see it shine through sometimes! She is definitely stubborn, and because of her deep-seated need to prove herself, she gets her team in trouble. Serious trouble. But she never stops fighting for them all, to save their lives, and she learns so much from her mistakes. The members of her team are each equally important to the story, and awesome in their own right. Oliver, the techno who is like a brother to Micheline, Jude, the mysterious one with a great sense of humor, and a serious libido, and finally Ryder, whom Micheline has known, and loved, forever. Each of these boys have great, individual, distinct personalities, and see the world in completely different ways. They are all so different from each other, but the respect and love that they share is awesome to see. I loved each of them, in a big way! The romance is of a forbidden sort, and it makes a tense, sweet, yet torturous story of its own. It is a romance that you root for, and root I did. I loved that it was there, and a part of this story, but that it never took front and center. Front and center belonged solely to the soulchain, and the fight to save their lives! Shutter was a fast-paced, action-packed thrilling ride full of new ghost hunting technology, fantastic characters, complicated relationships, strong friendships and a sweet romance. I had a blast reading this book! My only complaint is that I wanted more horror. More scares! Don't get me wrong, there were definitely some creeptastic moments, and chilling moments, which I adored. But nothing ever scared me, scared me. It didn't take away from my love of this awesome story though, and that tells me that Courtney Alameda has all the write stuff! (See what I did there?!) Now, as previously mentioned, GO READ THIS BOOK!